Finding yourself frantically Google searching “allergic reaction on face” when your skin is suddenly red and irritated after trying a new product? Don’t despair! Keep reading for the best skin care tips to soothe irritated skin. First, let me tell you about my own personal experience: A few months ago, I was so excited to try a product, so I slathered it on the second I got it. I couldn’t help it—it had rave reviews and I couldn’t wait to try it! Next thing I knew my face was red and irritated and I had swollen bumps all over. I panicked, of course, not knowing what to do and every product I put on my skin seemed to make it worse. 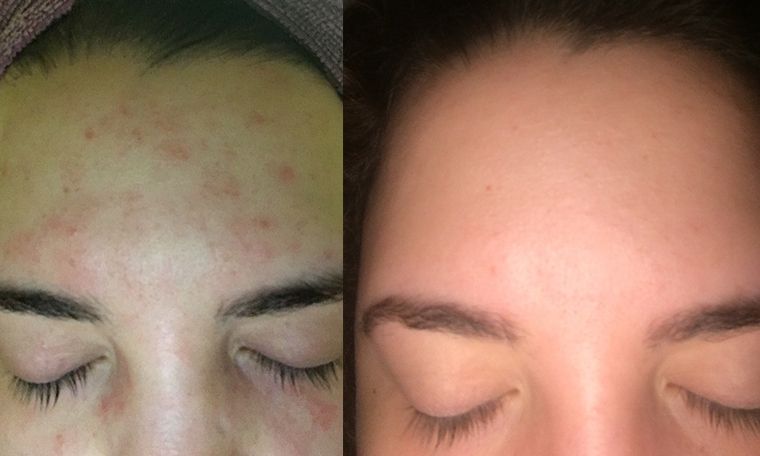 With a bit of trial and error, I figured out what worked best for my skin and within in a week it was looking and feeling much better. The best thing you can do for red, irritated skin is discontinue use of the offending product and retreat back to your basic hydrating routine. This means sticking with tried and true products you’ve used before and know haven’t irritated your skin. During times like these, don’t go for the full 10 step routine since you want to avoid as much irritation as possible. Stick with a simple routine, like our suggestion of the four steps of the Korean skin care routine that you should never skip. Going back to your basic routine will ensure you’re avoiding any other possible irritants and will help your skin get back on track. Pro Tip: Check out the ingredient list of the irritating product and keep it in mind for the future. Next time your skin experiences a reaction, you can cross reference the list to figure out which specific ingredient is irritating your skin. This will help you to make smarter skin care purchases! One of the worst things you can do is exfoliate when you already have irritated skin—doing so will only increase your sensitivity (especially if you’re already suffering from dry patches)! I bring gentle exfoliating back into my life once I’ve spent a couple of days doing my basic routine and my skin had started to clear up. I suggest skipping on the chemical exfoliator and going for a super gentle physical one. One of my favorites is the RE:P Bio Fresh Mask With Real Calming Herb since it’s chock full of soothing ingredients that will help to nourish and heal the skin. Fresh herbs like crushed chamomile and calendula will gently exfoliate while the kaolin will draw out any impurities without being drying.But please: Use what your skin’s familiar with and choose a gentle exfoliator that hasn’t irritated your skin before. Now is not the time to try out new products! You want to choose these ingredients because they are powerful at healing damaged skin. It’s no surprise aloe is on this list as it’s a well known skin calming ingredient that helps to heal and repair. Snail mucin is equally as soothing because it’s anti-microbial and packed with proteins, copper peptides, and hyaluronic acid, which all work together to repair skin damage and fight breakouts (It also has anti-aging properties!). When my skin was especially sensitive during my allergic reaction, I put on a light layer of the Missha Super Aqua Cell Renew Snail Cream and it was instantly cooling and hydrating. Propolis is also a good ingredient to look for since it’s a natural humectant that will help bind moisture to the skin and retain it for all day hydration, which is something your skin is craving when it’s damaged. When you’re dealing with irritated skin, you want to moisturize it as much as possible so the outermost epidermal layer of your skin can work to repair itself. Look for a moisturizer that is packed with ceramides since they create a protective layer that shields the skin from outside damage and helps retain moisture. One of my favorites is the Klairs Rich Moist Soothing Cream since it’s gentle on sensitive skin and works to improve the skin’s natural cell repairing capabilities. On any super red areas, I use my go to Klairs Midnight Blue Calming Cream, which is formulated with guaiazulene and centella asiatica extract, powerful skin healing ingredients. I slather on a thick layer and leave it on as an overnight treatment. There’s no better way to feed your skin with hydration than with a sheet mask. I’m a sheet mask junkie and I love to try new ones, but when my skin is freaking out it’s time to whip out the old, trusted (preferably soothing!) favorites. My go-to is the Leaders Balancing Recovery Mask, which I always reach for if my skin is feeling out of whack. These 20 minute treatments will help to soothe and deeply nourish the skin and help it repair itself quicker. To amp up the healing during my allergic reaction, I sheet masked every day, since most moisturizers stung upon application. The masks helped to moisturize my skin without causing further irritation. If your skin is red and irritated, don’t panic! Sure, when you’re working so hard to take good care of your skin, a reaction can feel pretty devastating and ultimately like a step backwards, but it happens, and with time it will heal. And take it from me, when I chose to break down my routine like this, my skin was already feeling and looking better within a week. Allergic reactions to products are also definitely an important lesson on why you should always patch test your products since everyone’s skin is different and can react differently to certain ingredients. + What’s your best tip to treat an allergic reaction? Let us know below!